Clean and easy to use, the envisioned space toilet is designed to be worn like a diaper around the astronaut’s waist at all times. Sensors detect when the user relieves him or herself, automatically activating a rear-mounted suction unit that draws the waste away from the body through tubes into a separate container. In addition to washing and drying the wearer after each use, the next-generation space toilet will incorporate features that eliminate unwanted sound and odor. Sure, you could do this. Or you could re-engineer humans for space such that they wouldn't need to wear these ridiculous hi-tech space toilets. That's why the concept of cybernetic organisms was developed in the first place; cyborgs don't wear diapers. George, I think you're taking this one just a bit too seriously. Human beings have a functional waste management system that allows for periodic evacauation; the need for some kind of constantly mounted, external, bulky beyond the common proprioceptic dimensions of the body is absurd. If I take the rationale behind the design of this thing and your comment to a logical extreme, human beings aren't designed for life on this biosphere, either, because we ocassionaly have to evacuate waste, which puts in an awkward position ill-suited to defense from predators. Although I'd like to see what happens far into the future, and I'd like this "self" to persist long enough to see it, I also happen to like the biological shell (which is part of that "self" package, informing both by capability and constraint) and would hope for environments suited to it, rather than force it to change for the sake of the environment. @Elf: The space diaper is one example of many that demonstrates how ill suited humans are for space travel. The negative impacts of zero g and radioactivity are more serious concerns -- but I used this example to illustrate the absurdity of humans in space in their current form. Changing the environment to suit the current human form is certainly an option. I'm just not sure it's a completely viable option. Space is freakin' dangerous and inhospitable. And given that we will be able to create cyborgs at some point in the future this option seems a bit more reasonable. It's the fragility of the human mind and body that I worry about. George & Elf: We need to think of space much like an express way... If you're going to be on the road, you need to learn how to hold it until we "get there". By the way, is the crap-sucker going to prevent an asteroid from slamming into you? No, didn't think so. Cyborgs, whatever form they end up taking, are still going to need energy in order to function -- meaning that there's invariably going to be *some* sort of byproduct. Whether it's poop or spent fuel cells, the need to manage waste and deal with the byproducts of energy use/storage is *always* going to be an issue. 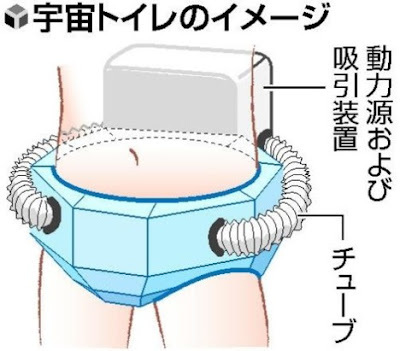 The "space diaper" does look pretty ridiculous and unwieldy, I'll grant that, but to suggest that cyborgs won't "poop" seems facile. Maybe they can engineer it to smell better (and I've had a bizarre idea for years about writing a sci-fi story in which biological waste is converted into something like spidersilk within the body, giving humans the ability to crap themselves a nice pullover), but still. The need to deal with it is going to be there no matter what. Physics and all, you know?